6A to 6E. Petraglyph of battle scene, figures not in their original relationship, undated, ʿOmānī, in situ, Wādī Aday, Oman (via Capt. C. Roe). 9. Iron parade-helmet from Ḥims, 1st century AD, Syro-Roman, National Museum, Damascus (Pob AI). 13. Relief, 4th-6th centuries AD, Ghassānid (? ), Suwaydā Museum (Dun). 18. Bronze statuette, 5th-6th centuries AD, Coptic, Coptic Museun no. 8798, Cairo (Hab). 19. Wax painting on wood, Gabriel, 6th century AD, Coptic, Coptic Museum no. 9083, Cairo (Hab). 20. Ivory box, 6th century AD, Coptic, British Museum no. 267, London. 21. Ivory box, 6th-7th centuries AD, Coptic, British Museum no. 298, London. 22. Manuscript, St. Menas, 6th to 8th centuries AD, Coptic, John Rylands Lib. Ms.S.33, Manchester (Ler C). 23. Ivory panels, 'Arab traders with the young Joseph,' Throne of Maximian, c.550 AD, Byzantine or Coptic, Cathedral Museum, Ravenna (Lar B & M). 32. Relief, Arsu, protector of caravans (? ), 2nd-3rd centuries AD, Dura-Europos, Yale University Art Gallery, New Haven (Perk). 33. Graffito, Clibanarius, 2nd-3rd centuries AD, Dura-Europos, Yale University Art Gallery, New Haven (Yale). 34. Fresco from Synagogue, Pharaoh's Guards, early 3rd century AD, Dura-Europos, National Museum, Damascus (Kra, Perk). 35. Fresco from Synagogue, Battle of Eben-Ezer, early 3rd century AD, Dura-Europos, National Museum, Damascus (Kra, Perk). 38. Shield or mantlet of reeds, late 3rd century AD, Sassanian (? ), Dura-Europos, Yale University Art Gallery, New Haven (Mes, Brow A). 39. Parade shield and bronze boss, late 3rd century AD, Syro-Romans Dura-Europos, Yale University Art Gallery, New Haven (Brow A, Con). 40. Iron helmet, late 3rd century AD, Sassanian, Dura-Europos, Yale University Art Gallery, New Haven. 41. Iron helmet, 3rd century AD, Sassanian from Nineveh, British Museum, London (Rob OA). 42. Relief, Ašadu and Sa'dai, 3rd century AD, Dura-Europos, National Museum, Damascus (Perk). 43. Relief, Fortune of Dura, 3rd century AD, Dura-Europos, Yale University Art Gallery, New Haven (Perk). 44. Relief, Aphlad, 3rd century AD, Dura-Europos, National Museum, Damascus (Perk). 45. Manuscript, "Joseph bar Nūn," Rabula Gospels, 586 AD, north Syrian, Bib. Laur. Plut. 1, f.4r, Florence (Ric AB, War). 46. Manuscript, Joshua, 6th-7th centuries AD, Syriac Mesopotamian, Bib. Nat. Ms. Syr. 341, f.52v, Paris (Ler S). 47. Restored clay frieze from Khaltchayana Reception Hall, 50 BC-50 AD, Parthian (ex-Pug). 48. Plaque, undated Parthian, British Museum no.91908, London (Maz). 49. Rock-relief, Parthian horseman c.200 AD, Parthian, in situ Tang-i Sarwak (Pope). 50A to 50C. Rock-relief, Triumph of Ardashir I, early 3rd century AD, Sassanian, in situ, Fīrūzābād (Rob OA, Pope). 51. Rock-relief, "Fallen Kushan (? )," Triumph of Bahrām II, late 3rd century AD, Sassanian, in situ, Naqsh-i Rustam (Pope). 52. Rock-relief, Triumph of Bahrām II, late 3rd century AD, Sassanian, in situ, Bīshāpūr (Pope). 53A and 53B. Rock-relief, A - "Sassanian page" B - "East Sassanian rebel (? )," Triumph of Hormuzd II, early 4th century AD, Sassanian, in situ, Naqsh-i Rustam (Pope). 54. Silver plate, Shāpūr II, late 4th century AD, Sassanian, Hermitage, Leningrad (WRW). 55. Iron helmet, 4th century AD, west Sassanian (? ), Metropolitan Museum, Rogers Fund no. 62.82, New York (Har). 56. Parthian-Cap style of iron helmet, 4th-5th centuries AD, Sassanian, British Museum, London (Rob OA). 59. Fresco, Sun God, late 6th-early 7th centuries AD, Fundūkistānī, Archaeological Museum, Kabul (Dag). 60. Fragment of terra-cotta figurine from Ak-Terek, Rider on an Armoured Horse, 1st (?) century AD, Khotanese, British Museum (ex-Stein A). 61A and 61B. Buddhist fresco from Painter's Cave, Kizil, 5th century AD, east Turkistānī, Museum für Völk., Staatliche Museen Dahlem, West Berlin (Coq). 62. Relief on an ossuary, 5th to 7th centuries AD, Uzbekistānī, Hermitage, Leningrad (Aka S). 63. 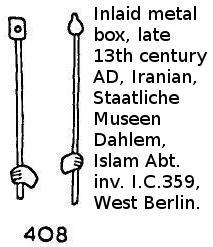 Bronze mace-head or sceptre, 5th to 7th centuries AD, Turkistānī (ex-Sar S). 64. Silver cup, 5th to 8th centuries AD, Khwarazmian, Hermitage, Leningrad (Belen). 65. Carved heads from Tumsuk, 6th-7th centuries AD, east Turkistānī, Museum für Völk., Staatliche Museen Dahlem, West Berlin (Coq). 66. Statue fragment from Toqquz Sarai, Tumsuk, 6th (?) century AD, east Turkistānī (ex-Stein S). 67. Fresco from Eastern Temple, Tumsuk, late 6th century AD, east Turkistānī (in situ. ex-Stein S). 68. 'Balbal' statues, 6th-7th centuries AD, Turkish, Hermitage, Leningrad (Wern). 69. Petraglyph of a battle scene, figures not in their original relationship, 6th-7th centuries AD, East Turkish, in situ, Char Chad, Mongolia (Now). 70. Relief in Khanagiri-Udayagiri, 1st century AD, Indian, in situ, Rani Gumpha. 71. Engraved copper cup from Taxila 1st-2nd centuries AD, Kushan (? ), British Museum (Rup). 72. Relief, The Departure of the Sakyamuni from the Palace, 2nd-3rd centuries AD, Ghandaran, Museum of Fine Arts, Boston. 73. Statuette, 2nd-3rd centuries AD, Ghandaran, Peshawar Museum. 74. Relief, The Host of Mara, 3rd to 5th centuries AD (? ), post-Ghandaran, Lahore Museum. 75. Relief, The Attack by Mura, 3rd to 5th centuries AD, post-Ghandaran, Peshawar Museum. 76. Fresco, Seated Foreigner and Attendant of Bodhisattva, late 5th century AD, Indian, in situ Cave 1, Ajanta (Ghosh). 78. Sarcophagus, mid-6th century AD, Visigothic, Provincial Archaeological Museum, Cordoba (Kin). 81. Sarcophagus, Soldiers, Daniel in the Lions' Den. 6th-7th centuries AD, Visigothic or Ibero-Byzantine, Archaeological Museum, Madrid (Kin). 82, Relief, 'Syrian Auxiliaries,' Trajan's Column, 113 AD, Roman, in situ. Forum, Rome (Rob OA, Con). 83. Fresco from a tomb, 2nd century AD, Gallo-Roman (ex-Sing). 85. Iron helmet, late 3rd century AD, Roman, Römermuseums Augst (Klu). 86. Iron helmet, late 5th-early 6th centuries AD, Frankish from Tolbiacum, Städtische Altertumsmuseens Mainz. 87. Iron helmet, late 5th-early 6th centuries AD, Frankish from Morken, Rheinisches Landesmuseum, Bonn (Dix). 90. Silvered dish, Isola Rizza Dish, late 6th-early 7th centuries AD, Byzantine or Lombardo-Byzantine, Castelvecchio Museum, Verona (Hes). 91. Bronze brow-plate of a helmet, late 6th-early 7th centuries AD, Lombardo-Byzantine, Bargello, Florence (Gui, Dix). 94. Relief, 'Dacians,' Tropaeum Traiani, 2nd century AD, Roman, in situ, Adamkilissi, Rumania (Dix). 95. Relief, 'Soldiers praying,' Column of Theodosius, late 4th early-5th centuries AD, Byzantine, in situ, Bayezit Hammam, Istanbul. 96. Iron helmet, 4th-5th centuries AD, from Intercisa, Roman, National Museum, Budapest (Klu). 97. Silver vase, c. 400 AD, from Concesti, Byzantine, Hermitage, Leningrad (WRW). 98. Statue base, Porphyrios, late 5th century AD, Byzantine, Archaeological Museum no. 2995, Istanbul. 101. Helmets, 5th century AD, from Kertch, Crimea, Turkish (ex-Thor A). 102. Statues, 5th-6th centuries AD, from Kertch, Crimea, Turkish, State Hist. Museum, Moscow (Rob OA). 115. Silver dish from Perm-Molotov, 7th century AD, Syrian or Palestinian, Hermitage, Leningrad (WRW). 116. A Coin of Khalif ʿAbd al Malik, 694-5 AD, Umayyad, Coll. of R. W. Morris (Kou); B. Umayyad dirham, American Numismatic Society. 119. Silk fabric from the Shrine of St. Kunibert, 8th century AD, Syrian, Erzbischöfliches Museum, Cologne. 120. Fresco from Qaṣr al Ḥayr al Gharbī, mid-8th century AD, Syrian, National Museum, Damascus (Ric B). 121. Fragmented statue from Qaṣr al Ḥayr al Gharbī, mid-8th century AD, Syrian, National Museum, Damascus. 122. Frescoes from Quṣayr ʿAmra, mid-8th century AD, Syrian, in situ, Jordan. 123. Statues from Khirbat al Mafjar, mid-8th century AD, Palestinian, Palestine Archaeological Museum, East Jerusalem (Ham). 124. Statue fragments from Khirbat al Mafjar, mid-8th century AD, Palestinian, Palestine Archaeological Museum, East Jerusalem (Ham). 125. Statue from Khirbat al Mafjar, mid-8th century AD, Palestinian, Palestine Archaeological Museum, East Jerusalem (Ham). 126. Fragmented statue from Khirbat al Mafjar, mid-8th century AD, Palestinian, Palestine Archaeological Museum, East Jerusalem (Ham). 127. Fresco from Khirbat al Mafjar, mid-8th century AD, Palestinian, Palestine Archaeological Museum, East Jerusalem (Ham). 128A to 128C. Syriac manuscript, A - Death of the Baptist, B - Crucifixion, C - Guards at the Tomb, 12th century AD, Syrian, British Library Ms. Add. 7169, ff. 9v, 11v and 12v (Ler S). 129. Ceramic bowl, 13th century AD, north Syrian, British Museum, London. 130. Inlaid metal basin, 1238-1240 AD, Syrian, Louvre no. 5991, Paris. 131. Enamelled glass flask, 1250-1260 AD, Syrian, British Museum no. 69.1.20.3, London. 132. Engraved steel mirror, late 13th century AD, Syrian, Topkapu Museum, Istanbul (Grub W). 133A to 133D. Manuscript, A - 'Qādī of Marāgha, ' B - 'Caravan to Mecca,' C - 'Guard of Qādī of Sacada,' D - 'Camel riders,' Maqāmāt of al Harīrī, 1275-1300 AD, Syrian, British Library Ms.Or.9718, ff. 24r, 120r, 153v and 173r, London. 135. Relief, 7th century AD (? ), Coptic, Staatliche Museen Dahlem, West Berlin (Bad). 136. Textile, Arab with the young Joseph, 7th century AD, Coptic, Hermitage, Leningrad (Shu). 137. Wool and linen embroidery, 7th century AD, Coptic, Textile Museum, Washington (Akad). 139. Wooden plaques from Luxor, 7th-8th centuries AD, Coptic, Coptic Museum nos. 8783-4, Cairo. 140. Relief, St. George, 8th century AD (? ), Coptic, Coptic Museum, Cairo (Mess). 141. Fresco, Sacrifice of Jeptha's Daughter, 7th-8th centuries AD, Byzantino-Egyptian, in situ, St. Catherine's Monastery, Sinai (Fors). 142. Wooden door panels, 9th century AD, Coptic, in situ, Church of Abū Sarga, Cairo (But). 143. Manuscript from St. Anthony in the Desert, Sts. Mercurius and Theodore, 9th-10th centuries AD, Coptic, Bib. Vat. Ms. Copt. 66, ff. 194r, 194v and 287v, Rome (Ler C). 145. Manuscript from Fayyūm, St. Theodore, 10th century AD, Coptic, Pierpont Morgan Lib. Ms. 613, f. 1v, New York (Ler C). 146. Paper fragment, 10th century AD, Fāṭimid, Keir Coll. I. 8, London (Rob I). 147. Papyrus fragment, 10th century AD, Egyptian, Rainer Coll., Bib. Nat, Vienna (Hea). 148. Ivory plaque, 10th century AD, Fāṭimid, Louvre, Paris (Kuh). 149. Ceramic fragment, 10th-11th centuries AD, Fāṭimid, Victoria and Albert Museum, London (But). 150. Ceramic fragment, 10th-11th centuries AD (? ), Fāṭimid, Museum of Islamic Art, Cairo (Mos). 151. Manuscript, St. Ptolomeus of Nikantori, 11th century AD, Coptic, Pierpont Morgan Lib. Ms. 581, New York (Ler C). 153. Wooden panels from the Fāṭimid Palace, 11th century AD, Fāṭimid, Museum of Islamic Art, Cairo (Elg). 155. Wooden panels, 11th-12th centuries AD, Fāṭimid, Louvre, Paris (Elg). 156. Ivory panels, 11th-12th centuries AD, Fāṭimid, Museum für Islamische Kunst no. 1.6375, West Berlin (Bris). 157. Manuscript fragment, 11th-12th centuries AD, Fāṭimid, Museum of Islamic Art, Cairo (Wis). 158. Paper fragment, 11th-12th centuries AD, Fāṭimid, Museum of Islamic Art no. 12801, Cairo. 159. Reliefs, c.1087 AD, Fāṭimid, in situ, Bāb al Naṣr, Cairo. 160. Paper fragment, 11th-12th centuries AD, Fāṭimid, Museum of Islamic Art, Cairo. 161. Paper fragment, 12th century AD, Fāṭimid, Dept. of Oriental Antiquities, British Museum (Gray B). 162. Ceramic dish, 12th century AD, Fāṭimid, Freer Gallery of Art no. 41.12, Washington (At). 163. Ivory panel, 12th century AD, Fāṭimid, Museum of Islamic Art no. 5024, Cairo. 166A to 1663. Manuscripts A - Guard at Gethsemane, B - Soldiers at the Crucifixion. C - Massacre of the Innocents, D - Herod's Guards, E - Beheading of the Baptist, F - The Betrayal, G - Guards of Pilate. H - Crucifixion, I - Guards at the Tomb, J - Executioner, Gospel, 1179-80 AD, Coptic, Bib. Nat. Ms. Copt 13, ff. 131r, 274r, 6v, 5r, 40v, 79r, 82v, 83v, 86r and 103r, Paris (Ler C). 167A to 167J, Manuscript, A - 'Front view of the Ziyār siege-bow and of a triple Ziyār siege-bow, ' B - 'Loading mechanism of a Ziyār siege-bow, ' C - 'Crossbow for shooting bottles of naft,' D - 'Crossbow housed within a shield,' E - 'The Rūmī or Frankish mangonel,' F - 'The Mangonel reinforced by a built-in crossbow,' G - 'The Arab mongonel,' H - 'The Persian or Turkish mangonel,' I - 'The Shabakah or movable mantlet,' J - 'Two forms of muthallathah or crow's feet,' Tabṣirah arbāb al albāb by al Ṭarsūsī, late 12th century AD, Egyptian, Bodleian Lib. Ms. Hunt 264, ff. 85, 87, 92, 117, 133, 134v-135r, 137, 138, 141 and 143, Oxford (Cah). 168. Paper fragment, Jazrafīl, c. 1200 AD, Ayyubid Egyptian, Dept. of Oriental Antiquities, British Museum, London (Gray). 170. Brass bowl inscribed to al ʿAdil, 1238-40 AD, Ayyūbid, Victoria and Albert Museum no. 8508.1863, London. 172A to 172C. Manuscript, A - Beheading of the Baptist, B Massacre of the Innocents, C - Centurion at Capernaum, Gospel, 1249-50 AD, Coptic, Institut Catholique Ms. Copte-Arabe 1, ff. 4v and 18v, Paris (Ler C). 173. Fresco, St. Theodore Stratelites, 13th century AD, Coptic, in situ, Church of St. Anthony in the Desert, Egypt. 174. Manuscript Kalila wa Dimna, 13th century AD, Mamlūk Egyptian, Topkapu Lib. Ms. Hazine 363, ff. 6r, 20v, 96v, 107 and 124, Istanbul. 175. Inlaid metal bowl, 13th century AD, Mamlūk, Staatliche Museen Dahlem, West Berlin (Pope). 177A to 177G. Inlaid bronze bowl, late 13th or early 14th centuries AD, Mamlūk, Victoria and Albert Museum no.740.1898, London. 178A and 178B. Inlaid metal basin, Baptistère de St. Louis. c. 1300 AD, Mamlūk, Louvre, Paris (Ric B). 179. Metal incense burner, late 13th-early 14th centuries AD, Mamlūk, Museum of Islamic Art no. 24078, Cairo. 180. Metal tray, late 13th-early 14th centuries AD, Mamlūk, Museum of Islamic Art, Cairo. 181. Fresco from Faras Cathedral, Gabriel, c. 710 AD, Nubian, Polish National Museum no. 234038MN, Warsaw (Michal). 182. Fresco from Faras Cathedral, Archangel Michael, late 8th century AD, Nubian, Polish National Museum, Warsaw (Michal). 183. Fresco from Faras Cathedral, St. Mercurius, late 8th century AD, Nubian, Polish National Museum no. 149672MN, Warsaw (Michal). 184. Manuscript, St. Menas, 9th-10th centuries AD, Nubian, British Library Ms, Or. 6805, f. 10, London. 185. Fresco from Faras Cathedral, Nativity, 10th century AD, Nubian, Sudan National Museum, Khartoum (Michel). 186. Fresco from Faras Cathedral, late 10th century AD, Nubian, Polish National Museum no. 234039MN, Warsaw (Michal). 187. Fresco fragment from the Church of ʿAbd Allāh Nirqi, St. Theodore Stratelites (?) c.990AD, Nubian, Sudan National Museum, Khartoum (Michal). 188. Fresco fragments from the Church of ʿAbd Allāh Nirqi, St. Mercurius and an unknown saint, late 10th-early 11th centuries AD, Nubian, Sudan National Museum, Khartoum (Michal). 189. Fresco fragment from the Church of ʿAbd Allāh Nirqi, St. Phiobammon (? ), early 11th century AD, Nubian, Sudan National Museum, Khartoum (Michal). 190A to 190C. A - 'Egyptians in the Red Sea,' B - 'Jacob and Esau,' C - 'Angel of Death,' 7th century AD, Byzantine North African, Bib. Nat. Nouv. Acq. Lat. 2334, ff. 68r, 25r and 65v, Paris (Gebh). 191. 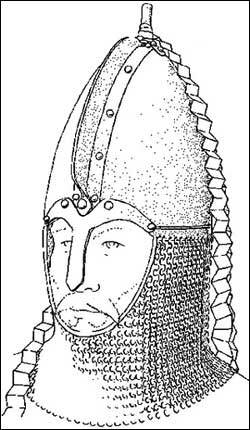 Iron helmet, 10th-11th centuries AD, Maghribī or Egyptian, Provincial Museum, Qayrawān (from a drawing by Dr. M. Brett). 192. Ceramic fragment from Sabra, late 10th-early 11th centuries AD, Maghribī, Bardo, Tunis (Zbi). 193. Ceramic plaque from Sabra, mid-11th century AD, Maghribī, Bardo, Tunis (Zbi). 194. Ceramic plaque from Sabra, mid-11th century AD, Maghribī, Bardo, Tunis (Zbi). 195. Relief, Hunters, 1050-1100 AD, Maghribī, Archaeological Museum, Algiers (Zbi ). 196A to 196D. Silver plates, A - 'Israelites, Goliath and Philistines,' B - 'David with Saul's armour,' C - 'Saul's soldiers,' D - 'David annointed,' The David Plates 613-629 AD, Byzantine, Metropolitan Museum, New York (WRW). 197. Manuscript,'Joshua,' The Joshua Roll, 7th century AD, Byzantine, Bib. Vat. Pal. Gr.431, Rome (Hea). 198. Ivory box, Defeated warriors of Ai (? ), 8th to 10th centuries AD, Byzantine, Victoria and Albert Museum no. 247.1865 (Gol). 199. Manuscript, Philistines seize Sampson, 9th century AD (? ), Byzantine, Bib. Nat. Cod. Gr. 923, f. 107v, Paris. 200. Manuscript, Chaldeans, 9th century AD, Byzantine, Bib. Vat. Cod, Gr.749, f. 19r (War). 201A to 201F. Manuscript, A - 'Guards at the Tomb,' B - 'The Betrayal,' C - 'Saul and the Zipheans,' D - 'The Arrest of David,' E - 'Guards at the Tomb,' F - 'Guards at Gethsemane,' Psalter, 9th century AD, Byzantine, Monastery of the Pantocrator Lib. Ms. 61, ff. 30v, 42v, [68v,] 65v, 109r, 89r and 151v, Mount Athos. 203. Manuscript, Psalter, late 9th century AD, Byzantine, Bib. Nat. Ms. Grec. 20, Paris (War). 204. Relief from Eskişehir, Demon (? ), 9th-10th centuries AD, Paulician, Archaeological Museum no.755, Istanbul (Grab S). 205. Fresco, The Betrayal, 9th-10th centuries AD, Byzantine, in situ, Kokar Kilise, Paristrema Valley, Cappadocia (Thi). 206. Ivory oliphant from Jasz-Bereny, 9th to 12th centuries AD, Byzantine, National Museum, Budapest (Hamp). 207. Fresco, early 10th century AD, Byzantine, in situ, Tokali Kilise, Göreme, Cappadocia (Cor). 209. Ivory reliquary, David and Goliath. 10th century AD, Byzantine, Cathedral Treasury, Sens. 210. Manuscript, Iliad, 10th century AD, Byzantine, Bib. Nat. [BNM] Ms. Gr. 454, Paris. 211. Manuscript, David and Goliath, 10th century AD, Byzantine, Bib. Nat. Ms. Gr. 139, f.4v, Paris (Hea). 212. Ivory box, Joshua defeats Ai, 10th century AD, Byzantine, Metropolitan Museum no. 17.190.137, New York (Hea). 213A and 213B, Fresco, A - Forty Martyrs, B - Donors, 963-969 AD, Byzantine, in situ, Dovecote Church, Çavuşin, Cappadocia (Cor). 214. Fresco, Pursuit of Elizabeth, 970-980 AD, Byzantine, in situ Chapel 11, Göreme, Cappadocia (Cor). 216A and 216B, Frescos A - Flight into Egypt, B - Crucifixion, 10th-11th centuries AD, Byzantine, in situ, Seki Kilisesi, Peristrema Valley, Cappadocia (Cor). 217. Relief plaque, 10th-11th centuries AD, Byzantine, Hermitage, Leningrad (Dar). 218. Ivory panel, 10th-11th centuries AD, Byzantine, Victoria and Albert Museum no. A525.1910 (Gol). 219. Ivory box, 10th-11th centuries AD, Byzantine, Royal Scottish Museum no. 1884.44.11, Edinburgh (Gol). 220A and 220B. Manuscript, A - "David and Goliath," and "Guards at the Tomb," B - "Judah attacks Jerusalem," Smyrna Octateuch, 10th-11th centuries AD, Byzantine, Bib. Vat. Cod. Gr. 746, ff. 455r, 471v and 469v, Rome (War, Thor A). 221. Mosaic, St. Prokopius, c. 1000 AD, Byzantine, in situ, Hosios Loukas, Greece (Dem). 222. Manuscript, The Killing of St. Mamas, 11th century AD, Byzantine, Greek Patriarchal Lib. Cod. 14, f. 27, Jerusalem. 223. Ivory box, 11th century AD, Byzantine, Cathedral Treasury, Troyes (Ric B). 225. Fresco, Crucifixion, c. 1070 AD, Byzantine, in situ. Sakli Kilise, Chapel 2A, Göreme, Cappadocia (Cor). 226. Relief from St. Catherine's Church, Digenes Akritas, 1100-1150 AD, Byzantine, Archaeological Museum, Thessaloniki (Grab S). 227. Alabaster plaque, St. George, 12th century AD, Byzantine, Archaeological Museum inv. 1000, Plovdiv. 228. Manuscript, John Chrysostom, 12th century AD, Byzantine, Bib. Nat., Ms. Gr. 806, f. 94v, Paris. 229. Ceramic fragment from the Athens Agora, St. George (? ), 12th century AD, Byzantine, Archaeological Museum, Athens. 230. Manuscript, Goliath, 12th century AD, Byzantine, Bodleian Lib., Ms. Barocci 15, f. 342r, Oxford. 231A to 231D. Frescoes, A - Christ before Pilate, B - Crucifixion, C - Road to Calvary, D - The Betrayal, c. 1200 AD, Byzantine, in situ, Hermitage of St. Neophytos, Enkleistra, Cyprus. 232. Manuscript, "The Man with three friends," Barlaam and Joasaph, late 12th-early 13th centuries AD, Byzantine, Iviron Monastery Lib., Ms. 463, f. 39, Mount Athos (Ners B). 233. Inlaid metal dish, 12th century AD, Byzantine or Caucasian, Basilevsky Coll., Hermitage, Leningrad (Dar). 234. Metal dish from Vilgort, Urals, 12th century AD, Byzantine or Caucasian, Hermitage, Leningrad (Dar). 235. Metal dish from the Prince's Palace, Chernigov, late 12th century AD, Byzantine or Caucasian Hermitage, Leningrad (Dar). 236. Manuscript, "Egyptians in the Red Sea," Barlaam and Joasaph, 13th century AD, Byzantine, King's College Lib., Ms. 338, f. 2, Cambridge (Ners B). 237A to 237C. Manuscript, A - Chaldeans, B - Driving the Women from the City, C - Reclining Demon, 13th century AD, Byzantine, Bodleian Lib., Ms. Barocci 201, ff. 18v, 163r and 36v, Oxford. 238. Fresco, Crucifixion, c. 1280 AD, Byzantine, in situ, Church of Panagiatou Moutoulla, Corfu. 239. Relief, Princes Nerseh Kamsekarand and David Saharouni, c.640 AD, Armenian, in situ Cathedral of Mren (Thi). 240A and 240B. Manuscript, A - St. Sergius, B - The Sacrifice of Isaac, 9th-10th centuries AD, Armenian, Library of the Mekhitarist Fathers Ms. 697, Vienna. 242. Manuscript, 'Yovhannes Protospathary,' Adrianople Gospel, 1007 AD, Armenian, San Lazzaro Lib., Ms. N. 887/116, Venice (Weit A). 243A and 243B. Manuscript, A - Guard at the Tomb, B - Crucifixion, 1038 AD, Armenian, Matenadaran Lib., Ms. - 6201, Yerevan (Dou). 244. Manuscript, The Betrayal, 1057 AD, Armenian, Patriarchal, Lib., Ms. 362G, Etchmiadzin (Mac). 245. Manuscript, The Betrayal, 11th century AD, Armenian, 11th century AD, Armenian, Matenadaran Lib., Ms. 974, Yerevan (Dou). 246. Manuscript, Guard of the King of Nineveh, 11th-12th centuries AD, Armenian, Vatopedi Monastery Lib., Ms. 608, f. 283, Mount Athos. 247. Manuscript, "Entry into Jerusalem" Haghbat Gospels, 1211 AD, Armenian, Matenadaran Lib., Ms. 6288, Yerevan Dou. 248. Manuscript, Massacre of the Innocents, mid-13th century AD, Armenian Cilicia, Matenadaran Lib., Ms. 7651, Yerevan (Dou). 249A to 249C. Manuscript, A - 'Pursuit of the Apostles,' B - 'Crucifixion,' C - 'The Betrayal,' Four Gospels, 1262 AD, Armenian, Walters Art Gallery, Ms. W. 538, ff. 116v and 191r, Baltimore (Ners A). 250A to 250E. Manuscript, A - Jesus before Pilate. B - Judgement of Pilate, C - Guards at the Tomb, D - The Betrayal, E - Jesus before Pilate, c. 1270 AD, Armenian, Freer Gallery, Ms. 32-18, ff. 180, 184, 194, 310 and 315, Washington. 251. Manuscript, 1289 AD, Armenian Cilicia, Matenadaran Lib., Ms. 979, Yerevan (Dou). 252. Coin of Qilij Arslān I, 1092-1106 AD, Saljūq Rūm, Bib. Nat., Paris. 253. Coin, early 12th century AD, Dānishmandid Anatolian, Bib. Nat., Paris. 254. Coin, early 12th century AD, Dānishmandid Anatolian, Bib. Nat., Paris. 255. Stucco relief of Qilij Arslān II, 1156-1188 AD, Saljūq Rūm, Museum of Turkish Art, Istanbul. 256. Fragment of gilded glass, 12th century AD, Saljūq Rūm, British Museum. 257. Fresco, Guards at the Tomb, 1200-1210 AD, Byzantino-Saljūq, in situ, Karanlik Kilise, Göreme, Cappadocia (Cor). 258. Relief from Konya, 13th century AD, Saljūq Rūm, Museum of Turkish Art, Istanbul (Ric S). 259. Inlaid metal candlestick, 13th century AD, Rūm or Azarbāyjān, Louvre, Paris. 260. Coin of Kaikhusrū II, 1242-3 AD, Saljūq Rūm, British Museum. 261. Coin of Qilij Arslān III, 1257-1267 AD, Saljūq Rūm, Bib. Nat., Paris. 262A and 262B. Frescoes, A - St. George, B - Crucifixion, 1283-1295 AD, Byzantino-Saljūq, in situ Kirkdam alti Kilise, Peristrema Valley, Cappadocia (Cor). 263. Manuscript, The Angle Shamhūrash, late 13th century AD, Saljūq Rūm, Bib. Nat., Ms. Anc. Fonds Pers. 174, Paris (Blo). 264. Relief, late 13th century AD, Saljūq Rūm, Ince Minara Museum, Konya (Ric S). 265. Sabres, late 13th (?) century AD, Saljūq Rūm, Bey Koyunoglu Coll., Konya (Ric S). 266. Iron helmets, late 13th-early 14th centuries AD, Saljūq Rūm, Topkapu Museum store, Istanbul (Sto T). 267A to 267C. Ivory book-cover, A - 'Goliath,' B - 'Pride,' C - 'fortitude,' Queen. Melisande’s Psalter, early 12th century AD, Crusader States, British Museum (Elg). 268. Manuscript, 'The Betrayal,' Queen Melisande's Psalter, 1131-1143 AD, Crusader States, British Lib., Ms. Egerton 1139 f. 7v, London (Bucht). 269. Capitals, late 12th century AD, Crusader States, Nazareth Museum (Pra). 270. Ceramic fragment from al Mīnah, early 13th century AD, Crusader States or Syrian, Antioch Museum. 271. Icons, 13th century AD, Crusader States, Monastery of St. Catherine, Sinai (Weitz). 272. Icon, late 13th century AD, Crusader States, Monastery of St. Catherine, Sinai (Weitz). 273. Manuscript,'Army of King Porus of India,' Histoire Universelle, late 13th century AD, Crusader States, Bib, Munic., Ms. 562(323), ff. 172v and 190, Dijon (Bucht). 274A and 274B. Manuscript, A - 'Siege of Antioch,' B - 'Siege of Tyre,' History of William of Tyre, c. 1280 AD, Crusader States, Bib. Nat., Ms. Fr. 9084, Paris (Bucht). 275A to 275J. Manuscript, A - "Frontispiece," B - "Soldiers of Nimrod," C - "Joseph's Brothers," D - "Soldiers of Nimrod," E - "Besieged castle," F - "Goliath," G - "Trojan or Greek," H - "Amazons," I - "Athenian," J - "Alexander's Soldiers," Histoire Universelle, c. 1286 AD, Crusader States, British Lib., Ms. Add. 15268, ff. 1v, 16r, 48r, 71r, 101v, 104, 105v, 123r, 136v and 208r, London (Bucht). 276A and 276B. Manuscript, A - "Muslim garrison of Antioch," B - "Crusaders capture Antioch," History of William of Tyre, late 13th century AD, Crusader States, Bib. Vat., Ms. Pal. Lat. 1963, ff. 40r and 49r, Rome (Bucht). 277. Ceramic fragment, 10th-12th centuries AD, Jazīrah, Staatliche Museen Dahlem, West Berlin. 278. Relief inscribed to Sultān Malik Shāh, 1089-90 AD, Saljūq, in situ, walls of Diyarbakr (Ber). 279. Enamelled bronze dish, early 12th century AD, Artuqid, Ferdinandeum, Innsbruck (Ric I). 281. Ceramic bottle-stopper from Raqqa, 12th century AD, Jazīrah, Staatliche Museen Dahlem, West Berlin. 282. Ceramic figurine, 12th century AD, Jazīrah or Iranian, National Museum, Damascus (Ric I). 283. Relief, St. Bahnām, c. 1164 AD, Syriac Jazīrah, in situ, Monastery of Mār Bahnām, near Mosul. 284. Stucco frieze dedicated to Tughril Beg, late 12th century AD, Saljūq, Museum of Art, Pennsylvania (Pop). 285. Ceramic bowl, late 12th century AD, Jazīrah, Staatliche Museen Dahlem, West Berlin (Bris). 286. Coin from Diyarbakr, late 12th-early 13th centuries AD, Artuqid. Bib. Nat., Paris. 287. Inlaid metal flask, early 13th century AD, Jazīrah, Freer Gallery of Art no. 41.10, Washington (Elg). 288. Inlaid metal writing box, early 13th century AD, Jazīrah, British Museum, Franks Bequest, London (Elg). 289. Inlaid metal ewer by Ibrāhīm ibn Mawālīyah, early 13th century AD, Mosul (? ), Louvre no. 34.35, Paris. 290. Manuscript, Automata, c. 1206 AD, Jazīrah, Topkapu Lib., Ms. Ahmad III 2115, Istanbul (Elg). 291. Manuscript, Kitāb al Aghānī, 1217 AD, Jazīrah, Millet Lib., Mss. Feyzuilah Effendi 1565 and 1566, Istanbul (Ric I). 292A to 292E. Manuscript, A - The Betrayal, B - Prayer of the Centurion, C - Denial of Peter, D - Jesus before Pilate, E - Crucifixion, F - Guards at the Tomb, 1216-1220 AD, Syriac Jazīrah, British Lib., Ms. Add. 7170, ff. 134v, 82, 146v, 145r, 151r and 160r, London (Ler S). 293. Inlaid metal cup, The Wade Cup, c. 1220 AD, Jazīrah or Azarbayjān, Museum of Art, Cleveland. 294A to 294C. Manuscript, A - Massacre of the Innocents, B - Stoning of Stephen, C - The Betrayal, 1226 AD, Syriac Jazīrah, ex-Bishop's Lib., Midyat, ff. 29v, 45v and 200r, now hidden (Ler S). 295. Inlaid metal candlestick by al Dhakī, and Ibn Jaldak, 1225 AD, Jazīrah, Museum of Fine Arts, Boston. 296. Inlaid metal ewer by Shujaʿ ibn Manā, The Blacas Ewer, 1232 AD, Jazīrah (? ), British Museum (Ric I, Pope). 297. Relief, Aleppo Gate, 1233-1259 AD, Jazīrah, in situ, al Hān, Jabal Sinjār (ex-F. Stark photographic exhibition, Inst. of Archaeology, London, 1976). 298. Relief, Bab al ʿAmādiyah 1233-1259 AD, Kurdistān, now destroyed, (via National museum archives Baghdad). 299. Inlaid metal basin by al Dhakī, 1238-1240 AD, Jazīrah, Louvre, Paris. 300. Inlaid metal candlestick-base, mid-13th century AD, Ayyūbid Jazīrah, Coll. of Dr. P. Costa (NC). 301. Inlaid metal vessel, The Fano Cup, c. 1250 AD, Jazīrah or Syrian, Bib. Nat., Paris. 302. Inlaid metal ewer by al Dhakī, The Homberg Ewer, 1242 AD, Jazīrah, Kofler Coll., Lucerne (Pope). 303. Relief, mid-13th century AD, Syriac Jazīrah, in situ, Monastery of Mār Bahnām, near Mosul. 304. Manuscript from Mosul, Kitāb al Diryak, mid-13th century AD, National Lib., Ms. AF. 10, Vienna (Mart). 305. Manuscript, A - The Betrayal, B - Crucifixion, C - Guards at the Tomb, c. 1250 AD, Syriac Jazīrah, Office of the Jacobite Metropolitan, Mardin (Ler S). 306A to 306F. Manuscript, A - The Betrayal, B - Denial of Peter, C - Beheading of the Baptist, D - Crucifixion, E - John Preaching, F - Massacre of the Innocents, 13th century AD, Syriac Jazīrah, Bib. Vat., Ms. Syr. 559, ff. 133v, 135v, 18v, 139r, 28r and 18r, Rome (Ler S). 307. Inlaid metal ewer by Yūsuf al Mawsilī 1246-47 AD, Jazīrah, Walters Art Gallery no. 54.456, Baltimore. 308. 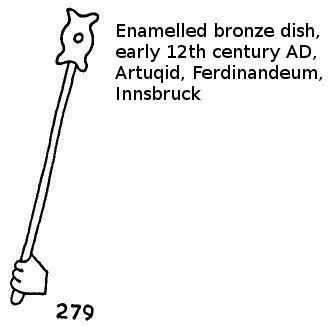 Inlaid metal candlestick, 13th century AD, Jazīrah, Staatliche Museen Dahlem inv.I.590, West Berlin. 309. Inlaid metal basin, late 13th century AD, Jazīrah, Kaiser Friedrich Museum no. 3031 or 3036, Berlin (Sar). 310. Manuscript, Maqāmāt al Ḥarīrī, 1256 AD, Jazīrah, British Lib., Ms. Or. 1200, f. 81r, London. 311. Manuscript, Maqāmāt al Ḥarīrī, late 13th century AD, Jazīrah, Suleymaniye Lib., Ms Esad Effendi 2916, ff. 89r, 92r, 93r and 118v, Istanbul. 312. Manuscript from Mardin,'Flight into Egypt,' Gospel, 1299 AD, Jazīrah, Bib. Laur., Ms. Or. 387, ff. 17v and 40r, Florence (Ler S). 313. Coin of Khalif al Mutawakkil, early 9th century AD, ʿAbbāsid, National Museum, Baghdad (Kou). 314. Fresco fragments from Jawsaq at Khāgānī, 836-839 AD: ʿAbbāsid, Museum für Islamische Kunst, West Berlin (Herz). 315. Medallion of Khalīf al Muqtadir Billāh, 9083-932 AD, ʿAbbāsid, Münzkabinett, Staatliche Museen Dahlem, West Berlin (Kau). 316. Coin of Khalīf al Muqtadir Billāh, 908-932 AD, ʿAbbāsid, National Museum, Baghdad (Kou). 317. Lustre dish, 10th century AD, ʿAbbāsid, Keir Coll., London. 318. Manuscript, Kitāb al Sufar, 1130 AD, Irāq, Suleymaniye Lib., Ms. Fatih 3422, Istanbul. 319. Manuscript, Kitāb al Aghānī, 1217-18 AD, Irāq, National Lib., Ms. 579, Cairo (Far). 320. Manuscript,'Allegorical figure of War,' ʿAbdullāh ibn al Faḍl, 1222 AD, Irāq, Royal Asiatic Society, London (Mart). 321. Manuscript, Materia Medica, 1224 AD, Irāq, Freer Gallery no. 575121, Washington. 322. Manuscript, Maqāmāt al Ḥarīrī, c. 1230 AD, Irāq, Oriental Inst., Academy of Sciences, Ms. S.23, Leningrad (Ett). 323. Manuscript, 'Bedouin' and 'Ghulāb,' Maqāmāt al Ḥarīrī, 13th century AD, Irāq, Bib. Nat., Ms. Arabe 6094, Paris. 324A to 324G. Manuscript, Maqāmāt al Harīrī, 1237 AD, Irāq, Bib. Nat., Ms. 5847, ff. 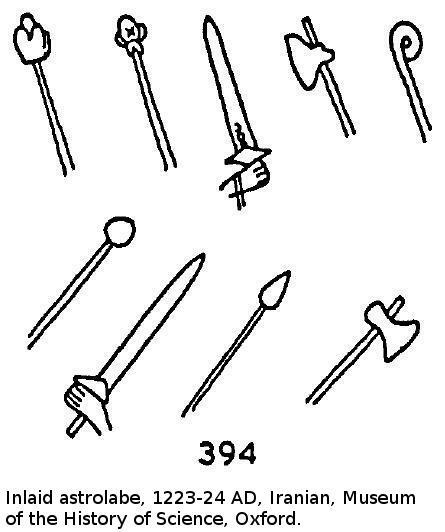 26r, 84v, 140r, 139v, 29v and 59r, Paris (ICC).
. 324A - "Spear of the Governor of Rahba,"
. 324B - "Sermon in a mosque,"
. 324C - "Slaughtering a camel,"
. 324D - "Feast in a tent,"
. 324E - "Mace or staff of a lawyer,"
. 324F - "Soldier at a burial scene,"
. 324G - "Guards of a ruler,"
325. Manuscript, Maqāmāt al Ḥarīrī, 1242-1256 AD, Irāq, Suleymaniye Lib., Ms. Esad Effendi 2916, ff. 89, 92 and 96v, Istanbul. 326. Sword attributed to an unnamed Khalīf, 13th century AD, Irāq, Topkapu Armoury, Istanbul (Zak). 327. First sword attributed to the Khalīf Mustecṣim Billāh, 1242-1258 AD, Irāq, Topkapu Armoury, Istanbul (Zak). 328. Second sword attributed to the Khalīf Mustecṣim Billāh 1242-1258 AD, Irāq, Topkapu Armoury, Istanbul (Zak). 329. Clay figurines from Wāsiṭ, 13th-14th centuries AD, Irāq, National Museum, Baghdad (Saf). 330A to 330I. Rock-cut statue, early 7th century AD, Sassanian, in situ Ṭāq-i Bustān (Fuk). 331. Bronze ewer, undated late Sassanian or early Islamic, Lewisohn Coll., New York (Pope). 332. Mixed iron and bronze lamellae, single lamellae, single lame and arrangement of lamas as found, from Qaṣr-i Abū Naṣr, mid-7th century AD, late Sassanian or early Islamic, Metropolitan Museum, New York (ex-Metropolitan Museum Bulletin, Dec. 1934). 333. Fresco, Sun and Moon gods, 7th century AD, Fundūkistānī, Archaeological Museum,, Kabul (Dag). 334. Statue from the Monastery of Fundūkistān, Donor figure, 7th-8th centuries AD, Afghanistānī, Kabul Museum (Ric A). 335. Glazed ewer from Hāmādan; late 7th century AD, Umayyad, ex-Demotte Coll., present location unknown (Pope). 336. Stucco head from Chal Tarkhan-Ashqābād, 7th-8th centuries AD, Umayyad, Archaeological Museum, Tehran (Thom S). 337. Stucco plaque from Chal Tarkhan-Ashqābād, 7th-8th centuries AD, Umayyad, Royal Ontario Museum no. 946.104.1-5 (Thom F). 338. Stucco plaque, 7th-8th centuries AD, Umayyad (? ), Museum für Islamische Kunst no. 4424, West Berlin (Thom F). 339. Stucco plaque, 7th-8th centuries AD, Umayyad (?) Metropolitan Museum no, 40.58, New York (Thorn F). 340. Coin of Yazīd ibn al Muhallab, early 8th century AD, Gurgān: Coll. of the American Numismatic Society. 342. Silver dish, 6th-9th centuries AD, Iranian or Transoxanian, Hermitage, Leningrad (Orb). 343. Ceramic bowl, 9th to 11th centuries AD, Iranian, Louvre, Paris (Pez). 344. Ceramic bottle, 9th-10th centuries AD, north Iranian, Louvre, Paris (Paz). 345. Ceramic bowl, 9th-10th centuries AD, Kurāsānī, Museum of Oriental Art dep. 196 Rome. 346. Ceramic plate, 10th century AD, Kurāsānī, Museum of Oriental Art no. 2629/3258, Rome. 347. Ceramic dish, 10th century AD, Kurāsānī, Coll. of Mr. Motamed, Frankfurt (Kle). 348. Ceramic bowl, 10th century AD, Kurāsānī, Furūghī Coll., Tehran (Ric I). 349. Fragment of ceramic bowl, 10th century AD, Kurāsānī, Archaeological Museum, Tehran. 350. Ceramic bowl, 10th century AD, Kurāsānī, Archaeological Museum, Tehran (Du R). 351. Ceramic plate, 10th century AD, Kurāsānī, Museum of Oriental Art, Rome. 352. Ceramic plate, 10th century AD, Kurāsānī, Nelson Gallery of Art, Kansas (Greg B). 353. Ceramic plate, 10th century AD, Kurāsānī, Museum of Oriental Art, Rome. 354. Ceramic bowl, 10th century AD, Kurāsānī, Metropolitan Museum no. 66.176, New York. 355. Fresco fragment from Sabz Pūshān, 10th century AD, Kurāsānī, (ex-Bulletin of the Metropolitan Museum. XXXIII 1938). 356. Fresco, 10th century AD, Nīshāpūr, Archaeological Museum, Tehran (Elg). 357. Silver medallion from Nīshāpūr, 10th century AD (? ), Kurāsānī, Bahrami Coll., Tehran (Kou). 358. Section of a gold necklace, 10th century AD, Iranian, Cincinnati Art Museum (Grab B). 359. Medallion of ʿAdud al Dawla (? ), late 10th century AD, Būyid, Freer Gallery of Art, Washington (Kou). 360. Silk textile, 10th-11th centuries AD, Iranian, K. Rabenou Coll., New York. 361. Manuscript, Book of Fixed Stars, 1009 AD, western Iranian or Iraq, Bodleian Lib., Ms. Marsh 144, ff. 110, 111 and 325, Oxford (Wel). 362. Bronze hilt and fragment of iron blade, early 11th century AD, east Iranian or Indian, Bodrum Castle Museum (Bas). 363. Stucco relief, 11th century AD, Iranian, Louvre, Paris. 364. Fresco, 11th century AD, Ghaznawid, in situ Lashkar-Bāzār, Afghanistan (Koh). 365. Relief, 11th to 13th centuries AD, Ghaznawid, Kabul Museum (Pope). 366. Iron mace-head, 11th to 13th centuries AD, Iranian, British Museum no. 838.89, London. 367. Chess pieces, 12th century AD, Iranian (? ), Metropolitan Museum nos. 07.288.70 and 1974.207 New York. 368. Bronze cauldron, The Bobrinski Bucket, 1163 AD, Harāt, Hermitage, Leningrad (Ric I). 369. Inlaid bronze lamp-stand, 12th century AD, east Iranian, Kabul Museum. 370. Bronze mirror, 12th century AD, Iranian, location unknown (ex-Pope). 371. Sgraffito bowl, 12th century AD, Iranian, Freer Gallery of Art no. 61.21, Washington (At). 372. Ceramic plate, 12th century AD, Iranian, Keir Coll. no. 151, London (Grub). 374. Ceramic tile, late 12th century AD, Iranian, Freer Gallery of Art no. 11.319, Washington (At). 375. Ceramic plate, late 12th-early 13th centuries AD, Iranian, Toledo Museum of Art, Edward Drummond Libbey Gift, Ohio (Grab B). 376. Ceramic tile, 12th-13th centuries AD, Iranian, Keir Coll, no. 1829, London (Grub). 377. Ceramic bowl from Rayy, King with attendants late 12th early 13th centuries AD, Iranian, Museum of Fine Arts no. 63.1386, Boston. 378. Ceramic tile, Iranians leave the castle of Farwad, late 12th early 13th centuries AD, Iranian, Museum of Fine Arts, Boston. (Pope). 379. Ceramic bowl, 12th-13th centuries AD, Ghaznawid, Kabul Museum. 380. Ceramic plate from Sāva, 12th-13th centuries AD, Iranian, Hermitage, Leningrad (But). 381. Ceramic figure from Gurgān, late 12th century AD, Iranian, Archaeological Museum, Tehran. 382. Ceramic figure, 12th-13th centuries AD, Iranian, Museum of Islamic Art no. 1750, Cairo. 383. Ceramic figure from Gurgān, late 12th-early 13th centuries AD, Iranian, Archaeological Museum, Tehran (Feh). 384. Fresco fragment from Rayy (? ), 12th-13th centuries AD, Iranian, present location unknown (ex-Pope). 385. Stucco relief from Rayy (? ), 12th-13th centuries AD, Iranian, Art Museum, Seattle (Pope). 386. Bronze candlestick-base, 12th-13th centuries AD, Iranian, Gulistān Museum, Tehran (Pope). 387. Bronze mirror, 12th-13th centuries AD, Iranian (? ), Louvre. Paris (Pope). 388A Iron mace-head, 12th-13th centuries AD, Iranian, Heeramaneck Galleries, New York (Grab P). 389. Inlaid bronze bowl, c. 1200 AD, east Iranian, British Museum no. 1950.7-25.1, London. 390. Ceramic beaker from Rayy, early 13th century AD, Iranian, Freer Gallery of Art, Washington (Lew). 391. Ceramic jug from Gurgān, early 13th century AD, Iranian, Victoria and Albert Museum, C. Ades loan no. 20, London. 392. Ceramic bowl, early 13th century AD, Iranian, Freer Gallery of Art no. 43-3, Washington (Elg). 393. Ceramic bowl, 1220 AD, Iranian, Keir Coll, no. 143, London (Grub). 394. Inlaid astrolabe, 1223-24 AD, Iranian, Museum of the History of Science, Oxford. 395. Inlaid metal candlestick, c. 1225 AD, Iranian, Museum of Fine Arts no. 57.148, Boston. 396. Inlaid metal mortar, 13th century AD, Iranian, Royal Scottish Museum no. 1909.545, Edinburgh. 397. Inlaid metal candlestick, 13th century AD, Iranian, Shrine of Ardabīl (Ric SI). 398. Carved stucco slab, 13th century AD, Iranian, Art Institute, Chicago (Rie). 400. Ceramic plate., 13th century AD, Iranian, present location unknown (ex-Pope). 401. Ceramic bowl, 13th century AD, Iranian, Metropolitan Museum, New York. 402. Ceramic tile, 13th century AD, Iranian, Staatliche Museen Dahlem, West Berlin (Pope). 403. Ceramic tile, 13th century AD, Iranian, Staatliche Museen Dahlem, West Berlin (Pope). 404. Fritware ceramic ewer, 13th century AD, north Iranian, Spinks Exhibition, April 1977, London. 405. Ceramic tile, 13th century AD, Iranian, Museum of Oriental Art inv. 1056, Rome. 406. Ceramic vase, 13th century AD, Iranian, National Museum, Damascus. 407. Gold or gilt sword quillons, 13th-14th centuries AD, Iranian, City Art Museum, St. Louis. 408. Inlaid metal box, late 13th century AD, Iranian, Staatliche Museen Dahlem, Islam Abt. inv. I.C.359, West Berlin. 409. Ceramic tile, 13th-14th centuries AD, Kāshān ware, Archaeological Museum, Tehran. 410. Manuscript, Shāhnāmah, late 13th century AD, west Iranian, British Lib., Ms. 1948.12, London. 411A and 4118. Grave-finds from north Caucasus, A - Composite bow, B - Leather helmet or hat, 8th-9th centuries AD, Alano-Saltove, Ethnog. Museum, Leningrad (Jer, Milov). 412A and 412B. Carved altar screen from Tsebelda church, A - St. Eustace Placidus, B - Guards at the Tomb, 9th-10th centuries AD, Georgian, S.N. Djanashiya State Museum, Tbilisi (Ric A, Elg). 413. Wooden door panel, 10th-11th centuries AD, Georgian, in situ, Chukuli, Georgia (Ars). 414. Wooden door panel, 10th-11th centuries AD, Georgian, in situ, Svupi Tsvurnski, Georgia (Ars). 415. Wooden door panels, 10th-11th centuries AD, Georgian, in situ, Lashes-Vani, Georgia. 416. Silver altar plaque from Shemokmedi, Guards at the Tomb, late 10th-early 11th centuries AD, Georgian, National Museum, Tbilisi (Mep). 417. Icon, St. George, 1010-1020 AD, Georgian, Hermitage, Leningrad. 418. Relief, mid-11th century AD, Georgian, in situ, Church of Nicorzminda (Mep). 420. Relief, 11th-12th centuries AD, Dāghistānī, Louvre, Paris (Salm). 421A and 421D. Manuscript, A - 'Prophecy of the Fall of Jerusalem,' B - 'Arrest and beheading of the Baptist,' Four Gospels of Djruchi, 12th century AD, Georgian, Academy of Sciences, Ms. H.1667, ff. 111 and 93, Tbilisi. 422A to 422X. Manuscript, Warqa wa Gulshāh, 12th century AD, Azarbayjān, Topkapu Lib., Ms. Hazine 841, ff. 13/15a, 3/6a, 3/6a, 4/7b, 7/9b, 8/10b, 9/11a, 10/12a, 11/13a, 12/13b, 13/15a, 17/18a, 20/20a, 22/21b, 23/22a, 24/23b, 24/25b, 37/35a, 38/36b, 39/37b, 40/38b, 43/40a and 69/66a, Istanbul (Malik). 423. Relief, 12th-13th centuries AD, Dāghistānī, Hermitage, Leningrad (Ric A). 424. Relief, 12th-13th centuries AD, Dāghistānī, Hermitage, Leningrad (Iv, Bask). 425. Relief, 12th-13th centuries AD, Dāghistānī, Hermitage, Leningrad (Iv, Bask). 426. Coin, of Queen Turakina. late 13th century AD, Georgian, Ray Gardner Coll., London (Law). 427. Iron cauldron, 13th-14th centuries AD, Dāghistānī, Victoria and Albert Museum, London (Iv, Bask). 428. Fresco from Piandjikent Reception Hall VI/1, 7th-8th centuries AD, Transoxanian, Hermitage, Leningrad (Aka S, Yaku). 429. Fresco from Piandjikent Room VI/41, 7th-8th centuries AD, Transoxanian, Hermitage, Leningrad (Aka S, Yaku). 430. Fresco from Piandjikent Reception Hall XII/1, 7th-8th centuries AD, Transoxanian, Hermitage, Leningrad (Aka S, Yaku). 431. Fresco from Piandjikent Room VI/41, 7th-8th centuries AD, Transoxanian, Hermitage, Leningrad (Aka S, Yaku). 432. Fresco from Piandjikent Room VI/4, 7th-8th centuries AD, Transoxanian, Hermitage, Leningrad (Aka S, Yaku). 433. Fresco from Piandjikent Reception Hall VI/1,7th-8th centuries AD, Transoxanian, Hermitage, Leningrad (Aka S, Yaku). 434. Fresco from Piandjikent House III/6, 7th-8th centuries AD, Transoxanian, Hermitage, Leningrad (Aka S, Yaku). 435. Fresco from Piandjikent Room XVI/10, 7th-8th centuries AD, Transoxanian, Hermitage, Leningrad (Aka S, Yaku). 436. Fresco from Piandjikent Room VI/41, 7th-8th centuries AD, Transoxanian, Hermitage, Leningrad (Aka S, Yaku). 437. Fresco from Piandjikent Room XXI/1, 7th-8th centuries AD, Transoxanian, Hermitage, Leningrad (Aka S, Yaku). 438. Fresco from Piandjikent Reception Hall VI/1, 7th-nth centuries AD, Transoxaniani Hermitage, Leningrad (Aka S, Yaku). 439. Fresco from Piandjikent Room XXI/1, 7th-8th centuries AD, Transoxanian, Hermitage, Leningrad (Aka S, Yaku). 440. Fresco from Piandjikent Room VI/55, 7th-8th centuries AD, Transoxanian, Hermitage, Leningrad (Aka S, Yaku). 441. Pottery figurines, 7th-8th centuries AD, Transoxanian, Hermitage, Leningrad (Belen). 442. Silver dish from Kulagysh, 7th-8th centuries AD, Khurāsāni or Transoxanian, Hermitage, Leningrad (Thor As Ric A). 443. Fragment of a painted shield from the Castle of Mug, early 8th century AD, west Turkistānī, Hermitage, Leningrad (Rob OAS Ric A). 444. Silver dish, 8th century AD, west Turkistānī, Hermitage, Leningrad (Rob QA). 445. Gold ewer, Nagyszentmiklos Treasure, 8th-9th centuries AD, north Caucasian (? ), Kunsthistoriches Museum, Vienna (Laz N). 446. Fresco from Ustrukhana, late 9th century AD, west Turkistānī, in situ, Tadjikstān (ex-Neg). 447. Silver dish, 9th-10th centuries AD, Transoxanian or Khurāsānī, Hermitage, Leningrad (Gor D, Knob). 448. Ceramic bowl, 10th century AD, Āfrāsiyāb or Nīshāpūr, Metropolitan Museum no. 40.170.23, New York. 449. Ceremonial miniature mace-head inscribed to Abu'l Fatḥ Muḥammad ibn Sulṭān 1199-1220 AD, Khurāsānī or Transoxanian, Spinks Exhibition, April 1977, London. 450. Statuette from Kizil, c. 700 AD, east Turkistānī, Museum für Völk., Staatliche Museen Dahlem, West Berlin (Coq). 451. Clay statuette from Astāna, 7th-8th centuries AD, east Turkistānī, British Museum (Stein S). 452. Fresco, 8th century AD, east Turkistānī, in situ. Qarashahr (Stein S). 453. 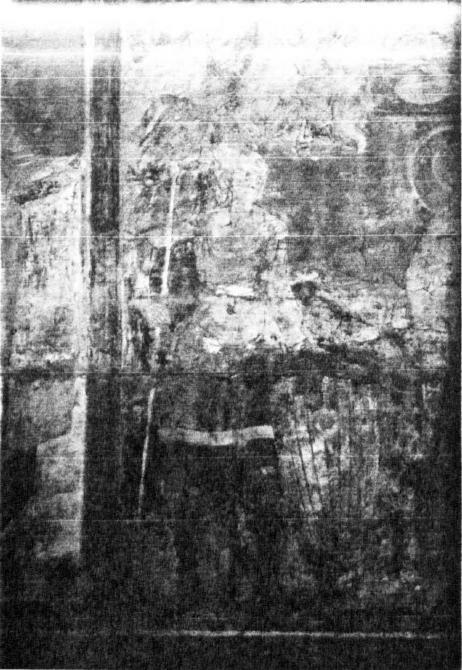 Buddhist fresco, Nāgarāya, 8th century AD (? ), east Turkistānī, in situ Kizil (Stein S, Coq). 454. Fresco in City Cave, 8th century AD, east Turkistānī, in situ, Sorcuk (Stein S). 455. Statuette from Sorcuk, 8th century AD, east Turkistānī, Museum für Völk., Staatliche Museen Dahlem, West Berlin (Coq). 456. Stucco horse from Ming Oi, 8th century AD, east Turkistānī, British Museum (Stain S, Coq). 457. Painted panel from Dandān Uiliq, c. 780 AD, Khotanese, British Museum (Stein A). 458. Statuette fragment from Ming Oi, 8th to 10th centuries AD, east Turkistānī, British Museum no. Mi. XI. 6010. 459. Ceramic horse from Ming Oi, 8th to 10th centuries AD, east Turkistānī, British Museum no. Mi. XI. 00138 (Ric A). 460. Assorted leather lamellae from Mīrān, late 8th-early 9th centuries AD, Tibetan, British Museum (Stein A). 461. Statue fragment from Sorcuk, 8th-9th centuries AD, east Turkistānī, museum für Völk., Staatliche Museen Dahlem, West Berlin (Coq). 462. Painted silk and paper fragments from a Manichaean temple, Kačo, 8th-9th centuries AD, east Turkistānī, Museum für Völk., Staatliche Murseen Dahlem, West Berlin (Coq). 463. Statuette from Qarashahr, 9th century AD, east Turkistānī, British Museum. 464. Painted paper fragment from Yār, 9th century AD, east Turkistānī, Staatliche Murseen Dahlem, West Berlin (Coq). 465. Fresco from Avolkitesvaru, Bäzäklik, 9th-10th centuries AD, east Turkistānī, Museum für Völk., Staatliche Museen Dahlem, West Berlin. 466. Painted silk fragment from Toyuq, 9th-10th centuries AD, east Turkistānī, Staatliche Museen Dahlem, West Berlin (Coq). 467. Fresco from Turfan, 9th-10th centuries AD, east Turkistānī, Museum für Völk., Staatliche Museen Dahlem, West Berlin (Coq). 468. Fresco from Bäzäklik, Semitic and Iranian merchants, 9th-10th centuries AD, east Turkistānī, Staatliche Museen Dahlem, West Berlin. 469. Re-engraved Sassanian metal plate from Perm, 7th-8th centuries AD, Siberian, Hermitage, Leningrad. 470. Silver-mounted sword from the Altai mountains, 6th century AD, Turkish, Hermitage, Leningrad. 471. Tomb figure, 385-535 AD, Northern Wei Chinese, Musée Cernuschi, Paris (Rob OA). 472. Tomb figure, 335-535 AD, Northern Wei Chinese, British Museum, London (Rob OA). 473. Ceramic statuette, 7th-8th centuries AD, Chinese, British Museum no. 1938.524.48, London. 474. Statuete, late 7th-early 8th centuries AD, Chinese, British Museum no. 1925.12-19.1, London. 475. Free-standing stone "Balbal", 7th-9th centuries AD*, east Turkish, in situ, Altan-Sandal, Mongolia (Now). 476. Iron arrow-heads, 7th to 10th centuries AD, east Turkish, Mongolia, present location unknown (ex-Now). 477. Ceramic figurine, Semitic trader, 9th century AD (? ), Chinese, Royal Ontario Museum (Mah). 478. Ceramic statuette, Soldier, 9th century AD (? ), Chinese, Nelson Gallery, Kansas (Lau). 479. Ceramic statuette, Officer, 9th century AD (? ), Chinese, Royal Ontario Museum (Lau). 480. Tomb figure, 907-960 AD, Five Dynasties Chinese, Coll. of M. Sorimachi, Tokyo (Rob OA). 481. Tomb figure, 907-960 AD, Five Dynasties Chinese, Metropolitan Museum, New York (Rob OA). 482. Drawing by Koo Hsüan, c. 1135 AD, Chinese, present location unknown (ex-Nee). 483. Manuscript drawing, Mongol rider with his horse, 1280-1368 AD, Chinese, Snark International Coll., Paris. 484. Relief, Attendants of the Sun God, c.700 AD, Indian, British Museum. 485. Relief, 8th century AD, Javanese, in situ, Borobudur (Ver). 486. Statue from Orissa, Durqa, 8th century AD, Indian, British Museum no. 1872.7-1.39. 487. Ivory chess piece, 9th century AD, Sindian or Afghanistānī, Bib. Nat., Cabinet des Medailles inv. 311, Paris (Du R). 488. Statue, Durqa a slays the buffalo demon, 9th-10th centuries AD, east Indian, British Museum no. 1872.7-1.79. London. 489. Relief from Kanauj, Attendants of Vishnu, late 10th century AD, central Indian, British Museum no. 1872.7-1.41, London. 490. Relief, Yasoda suckling Khrishna, c. 1000 AD, east Rajastānī, British Museum no. 1872.7-1.107, London. 491. Relief, 11th-12th centuries AD, Indian, in situ, Orissa. 492. Iron horse-bit, early 8th century AD, Visigothic or Andalusian, Real Armeria, Madrid (Hof A). 493. Iron horse-bit, 8th-9th centuries AD, Andalusian, Metropolitan Museum no. 47.100.24, New York. 494. Ceramic fragment from Madīna al Zahra, 10th century AD, Andalusian, Madina al Zahra Museum. 495. Ivory chess piece, 10th century AD (? ), Andalusian, Fulda Coll., Frankfurt (Weit). 496. Ivory box inscribed to Ziyād ibn Aflah, 969-70 AD, Andalusian, Victoria and Albert Museum, London (Beck). 497. Ivory box inscribed to ʿAbd al Malik al Muzaffar, 1005 AD, Andalusian, Cathedral Treasury, Pamplona (Beck). 498. Relief on a fountain basin, early 11th century AD, Andalusian, Archaeological Museum, Jativa (Bae). 499, Ivory box from Cuenca 1026 AD, Andalusian, Archaeological Museum, Burgos (Hof A). 500. Silk fabric from the Tomb of San Pedro de Osma, Cathedral of Burgo de Osma, Andalusian, Museum of Fine Arts, Boston (Bre). 501. Ivory plaque, 13th century AD, Mudejar, Hermitage, Leningrad. 502. Manuscript, Apocalypse, c. 840 AD, Spanish, Bib. Munic., Ms. 99, ff. 12v, 13r, 40v and 19r, Valenciennes (War). 503. Relief on vaulting boss, 848 AD, Spanish, in situ, Church of Santa Maria, Naranco (Corr). 504A to 504E. Manuscript, A - 'Destruction of Jerusalem,' B - 'Victory of the Lamb,' C - 'Taking of the Beast,' D - 'Appolyon,' E - 'Army of Nebuchadnezzar,' Beatus, 922-952 AD, Mozarab, Pierpont Morgan Lib., Ms. 644, ff. 151, 211, 200 and 142v, New York (Hof A). 505. Manuscript, 'Army of Nebuchadnezzar,' Beatus, 10th century AD, Mozarab, Cathedral Lib., Seo de Urgel (Hof A). 506. Manuscript, 'Goliath,' Bible of San Isidore de Leon, 960 AD, Mozarab, Real Colegiata Basilica de San Isidoro, Leon (Hof A). 507A to 507H. Manuscript from Tavera, A - 'Destruction of Jerusalem,' B - 'Angel,' C - 'Defence of Jerusalem,' D - 'Horsemen of the Apocalypse,' E - 'The Lamb overcomes the Beast,' F - 'Guards of Darius,' G - 'Herod’s Soldiers,' H - 'Guards at the Tomb,' Beatus, 975 AD, Mozarab, Cathedral Museum, ff. 166r, 156r, 242r, 126, 113, 134, 25 and 28, Gerona (Hof A). 508. Ivory box, Herod's Guards, c. 1000 AD, Spanish, Demotte Coll. 509. Manuscript, 'Defence of Seville,' Codex Albeldense, 979 AD, Mozarab, Escorial (Hof A). 510. Manuscript, Psalter of San Millan de la Cogolla, 11th century AD, Mozarab, Bib. da la Academia de la Historia, Madrid (Chu). 511. Manuscript, Beatus of Sancho the Brave, 11th century AD, Mozarab, Bib. Nac., Madrid (Chu) . 512. Metal altar-back, Demon at Crucifixion, 1075 AD, Spanish, Camera Santa, Oviedo. 513. Manuscript: 'Horsemen of the Apocalypse,' Beatus, 1086 AD, Cathedral Lib., Burgo de Osma (Hof A). 514. Relief from Santa Cruz de los Seros, Tomb of Doña Sancha, 1095 AD, Spanish, in situ, Benedictine Convent, Jaca (Kin). 515. Manuscript, Roda Bible, 11th century AD, Catalan, Bib. Nat., Ms. Lat. 6, ff. 99v, 19v, 145, 144, 83r, 134r, 144r, 19v, 99v, 134, 144 and 145 (Hof A). 516. Capital from the Pyrenees, 11th-12th centuries AD, Spanish or south French, Metropolitan Museum no. 21.21.2, New York. 517A to 517E. Manuscript, A - 'Troops demolish walls,' B - 'Goliath,' C - 'Angels' D - 'Angel,' E - 'Horsemen of the Apocalypse' Beatus, 1091-1109 AD, Mozarab, British Lib., Ms. Add. 11695, ff. 143, 194, 198 and 202 (Hof A). 518. Fresco from San Baudelio de Berlanga, Soria, early 12th century AD, Mozarab, Prado, Madrid. 519. Relief, Martyrdom of Sts. Sabina, Cristela and Vincenti, early 12th century AD, Spanish in situ, Church of St. Vincent, Avila (Hof A). 520. Manuscript, Beatus, early 12th century AD, Spanish, Archaeological Museum, Madrid (Hof A). 521A to 521F. Relief, A - "Spear of David," B - "Paul incites the Jews," C -"Battle with Amalekites," D - "Guards of Gad," E - "Imprisonment of Paul," F - "Joshua fights Amalekites," Arch of the Triumph of Christianity, mid-12th century AD, Catalan, in situ, Portal of the Monastery of S. Maria, Ripoll (Jun). 522. Capital, Templer fighting Moor, 12th century AD, Spanish, in situ, Church of St. Martin, Segovia. 523. Sculpture, Guards at the Tomb, 12th century AD, Spanish, in situ, Cloisters, Monastery of Santo Domingo do Silos (Loj). 524. Relief, c. 1155 AD, Spanish, in situ, Church of Santa Maria la Real, Sanguesa, Navarre. 525. Capital from Santa Maria do Aguilar de Campo, Massacre of the Innocents, 12th century AD, Spanish, Archaeological Museum, Madrid. 526. Relief on sarcophagus, 12th century AD, Spanish, Nuestra Senora de Irache, Estella. 527. Relief, St. Vincent, mid-12th century AD, Spanish, in situ, Portal, San Isidoro, Leon. 528. Capitals, mid-12th century AD, Spanish,in situ, Cloisters, San Pedro, Soria. 529. Relief, St. James, 12th century AD, Spanish, in situ, Church of Santiago, Betangos, La Coruña. 530. Manuscript from Santo Domingo do Silos, Guards at the Tomb, 12th century AD, Spanish, Bib. Nat., Nouv. Acq. Lat. 2176, f. 265, Paris. 532. Manuscript, Usatages of Berenguer I, late 12th century AD, Catalan, Escorial (Tre). 533. Capital, c. 1200 AD, Spanish, in situ, Monastery of Las Huelgas, Burgos. 534. Capital, Faragut, late 12th century AD, Spanish, in situ, Cloisters, Cathedral, Tarragona. 535. Relief, late 12th century AD, Spanish, in situ, Ermita Santiago, Aguera, Huesca (Kin). 536. Capital, Faragut, late 12th century AD, Spanish, in situ, Old Cathedral, Salamanca. 537. Capital, Faragut and companion, late 12th century AD, Spanish, in situ, Palace of the Dukes of Granada, Estella (Elg). 538. Manuscript, "Guards at the Tomb," Avila Bible, 12th-13th centuries AD, Mozarab, Bib. Nac., Ms. ER8 f. 324v, Madrid. 539. Fresco, Martyrdom of St. Thomas of Canterbury and the Monk Edward Grim, c. 1175-1200 AD, Catalan, in situ, Church of S. Maria, Egara-Tarrasa (Dem R). 540. Fresco from the Church of San Baudelio de Berlenga, The Marys at the Tomb, late 12th century AD, Spanish, Museum of Fine Arts, Boston. 541. Fresco, Arrest of St. James-Major , early 13th century AD, Spanish, in situ, Santo Juan Ermita, Uncastillo. 542. Manuscript, St. George, 13th century AD, Mozarab, Real Academia de la Historia, Madrid. 543A to 543G. Manuscript, A - 'Horsemen of the Apocalypse,' B - 'Army of Nebuchadnezzar,' C - 'Destruction of Jerusalem,' D - 'Victory of the Lamb,' E - 'Fruits of the Earth,' F - 'Punishment of the False Prophet,' G - 'Horsemen of the Apocalypse,' Beatus of Liebaña, c. 1220 AD, Spanish, Pierpont Morgan Lib., Ms. 429, New York (Elg ). 544A to 544E. Manuscript, A - 'Pharoah's Army,' B - 'Pharoah's Guards,' C - 'Siege of Jericho,' D - 'Goliath,' E - 'Defeat of the Amalekites,' Bible of San Millan de Cognolla, 13th century AD, Spanish, Real Academia de la Historia, Mss. 2 and 3, ff. 40v, 123, 49 and 170, Madrid. 545A to 545I. Manuscript, A - 'Bodyguard of the Sultan,' B - 'Saracens besiege Constantinople,' C - 'Moors,' D - 'Moors,' E - 'Moors,' F - 'Moors,' G - 'Moors,' H - 'Moors,' I - 'Moors,' Cantigas of Alfonso X, late 13th century AD, Spanish, Escorial Lib. (Lov). 546A. to 546C. Manuscript, A - "Muslim Soldiers," B - "Sword of Arab," C - "Sword of Christian," Chronicle of Alfonso X, late 13th century AD, Spanish, Escorial Lib., Ms. T. 1.1, f. 181. 547. Manuscript, "Moors and Orientals," Libra de los Juegos, 1283 AD, Spanish Escorial Lib., Ms, T. j. 6. 548. Fresco, James of Aragon enters Valencia, Muslim Garrison, late 13th century AD, Spanish, in situ, Castel d'Alcanyis. 549. Painted wooden panel, c. 1300 AD, Spanish, Museum of the History of Barcelona, Barcelona. 550. Manuscript, Martyrdom of Santa Lucia, late 13th century AD, Spanish, Bosch Coll., Barcelona. 551A and 5518. Fresco, A - "Muslim garrison," B - "Muslim army," Conquest of Majorca by James I of Aragon, late 13th century AD, Spanish, Museo de Artes de Cataluna, Barcelona. 552. Manuscript, "Pharoah's Army," Haqqada Resach, 13th-14th centuries AD, Jewish-Spanish, British Lib., Ms, Or. 2884, London. 553. Iron helmet and detail of decoration, Sutton Hoo Treasure, early 7th century AD, Anglo-Saxon, British Museum (Dix). 554. Bronze plaque, 7th-8th centuries AD, Lombard, Bargello, Florence. 555. Stirrup, late 7th-early 8th centuries AD, Lombard (ex-Monumenti Antichi, XII). 556. Bronze belt-end, late 7th-early 8th centuries AD, Lombard (ex-Monumenti Antichi, XII). 557. Manuscript, Stuttgart Psalter, early 9th century AD, Carolingian, Württembergischer Landesbibliothek, f. 23, Stuttgart. 558. Manuscript, "Crucifixion," Exultet Roll, 9th-10th centuries AD, south Italian, John Rylands Lib., Ms. 2, Manchester (Ave). 559. Mosaic, King Arthur, 9th-10th centuries AD, Italo-Byzantine, in situ, Church of the Pantocrator, Otranto. 560. Manuscript, Avatea, 10th century AD, south Italian, Monte Cassino Lib., Ms. 3, f. 186. 561. Ivory beaker, Guards at the Tomb, c. 960 AD, north Italian, Victoria and Albert Museum, London. 562. Manuscript, 'The Army of the Emperor,' Exultet Roll, 981-987 AD, south Italian, Bib. Vat., Ms. Lat, 9820, Rome (Ave). 563. Manuscript,'Sacrifice of Isaac,' Beatus of St Sever, 1028-1072 AD, south French, Bib. Nat., Nis. Lat. 8878, f. 8, Paris (War). 564A and 564B. Manuscript, A - "Labarinthus," B - "On Weapons," Encyclopedia of Maurus Hrabanus, 1023 AD, south Italian, Monte Cassino Lib., Ms. 132, ff. 348 and 363 (War). 565. Relief, Arrest of Jesus, mid-11th century AD, south Italian, in situ, Tomba di Rotari, Monte San Angelo. 566. Ivory oliphant from Chartreuse de Portes, mid-11th century AD, Amalfitan, Bib. Nat., Paris (Swar). 567. Ivory oliphant, Centaur, 11th century AD, south Italian, Museum of Fine Arts no. 57.58.L, Boston (Swar). 569. Manuscript, Leges Langobardorum, 11th century AD, south Italian, Badia della Sentissima Trinita Archives, Cod, 4, f. 192, Cava (Ave). 570. Manuscript, Aesop, 11th century AD, Italo-Byzantine, Pierpont Morgan Lib. Ms. 397, ff. 23r and 24r, New York. 571. Ivory box from Farfa, Crucifixion, c. 1070 AD, central Italian, Treasury, San Paolo fuori le Mura, Rome. 572. Capital, Demon, late 11th century AD, in situ, Cathedral of St. Sernin, Toulouse. 573. Carved altar, 11th-12th centuries AD, south Italian, Santa Maria in Valle Porclaneta. 574. Relief, late 11th century AD, Italo-Norman, in situ, Church of San Bernadetto, Brindisi. 575. Capitals, 1087-1119 AD, south French, in situ, Cloisters, Ste. Foy, Conques. 576. Relief, Pharoah's Army (? ), early 12th century AD, Italo-Norman, in situ, west front, Church of San Nicola, Bari. 577A and 577B. Relief, A - 'Defenders,' B - 'Attackers,' Capture of Jerusalem in First Crusade (? ), early 12th century AD, Italo-Norman, in situ, north door, Church of San Nicola, Bari. 578. Capital, Infidel, early 12th century AD, French, in situ, Cathedral, Vézelay. 579. Relief, The Betrayal, early 12th century AD (? ), north Italian, in situ, Crypt, Cathedral, Pistoia. 580A to 580D. Stained glass windows from St. Denis, now lost, A - 'Capture of Nicea,' B - 'Capture of Jerusalem,' C - 'Egyptians flee into Ascalon,' D - 'Battle of Dorylaeum,' E - 'Defeat of Karbugha,' The first Crusade. 12th century AD, French (ex-Montfaucon Coll. of Engravings, Bib. Nat., Paris). 581. Stained glass windows, "Moors," The Legend of Roland and Oliver, 12th century AD, French, in situ, Cathedral, Chartres. 583. 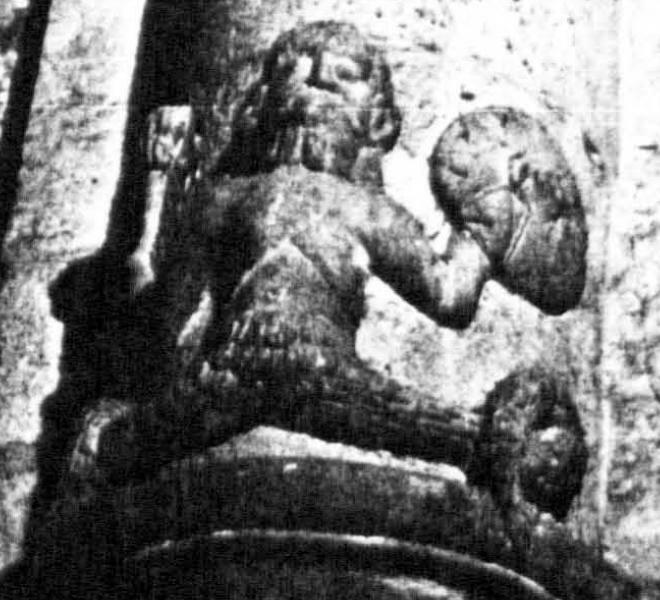 Relief, Merman, 12th century AD, Italo-Norman, in situ, Cathedral, Bitonto. 584. Fresco, now lost, from Poncé Serthe, Episode from the Crusades, 12th century AD, French (ex-Services des Monuments Historiques). 585. Relief from the Porte Romana, 12th century AD, north Italian, Castello Sforzesco Museum, Milan (Nor). 586. Relief, Goliath, 12th century AD, south French, in situ, Church of St. Giles, St. Giles du Gard. 587. Candelabrum by Nicola d'Angelo and Pietro Vassalletto, Guards of the High Priest, c. 1170 AD, central Italian, San Paolo fuori le Mura, Rome. 588. Bronze door panels, late 12th century AD, Italo-Norman, in situ, Trani Cathedral. 589. Manuscript, Soldier at the Passion, c. 1160 AD, Austrian, Abbey of St. Peter Lib., Cod. A. XII.7, f. 629, Salzburg. 590. Fresco, Murder of Becket, late 12th century AD, Italian, in situ, Santi Giovanni e Paolo, Spoleto (Ter). 591. Relief, Arrest of St. Aventin by Moors, late 12th century AD, south French, in situ, Church of St. Aventin, Haute Garonne. 592. Manuscript, "Charlemagne leaves for Spain," Codex Calixtinus, late 12th century AD, French or Spanish, Archivo Catedral, f. 162v, Santiago de Compostella (Fos). 593. Relief, Crusaders besiege Cathar Carcassonne, early 13th century AD, south French, in situ, Church of St. Nazaire, Carcassonne. 594. Metal chest of Abbé Nantelme, 1225 AD, Swiss, Abbey of St. Maurice, Switzerland. 595. Fresco, Infidel 13th century AD, south French, in situ, Tour Ferrande, Pernes-les-Fontaines. 596. Manuscript, Maciejowski Bible, c. 1250 AD, French, Pierpont Morgan Lib., New York (Coc). 598. Ivory box, 11th century AD, Sicilian, Staatliche Museen Dahlem inv, K. 3101, West Berlin (Bris, Kuh). 599. Ivory oliphant, 11th century AD, Sicilian or south Italian, Metropolitan Museum no. 04.3.177 New York (Kuh). 600. Ivory box, 1050-1100 AD, Sicilian or south Italian, Metropolitan Museum no. 17.190.241, New York (Kuh). 601. Ivory oliphant, late 11th century AD, Sicilian or south Italian, Musée Crozatier, Le Puy. 602. Ivory oliphant, late 11th century AD, Sicilian or south Italian, Victoria and Albert Museum loan, London. 603A to 603E. Ivory altar-back, A - Guards at the Tomb, B - Herod's Soldiers, C - Sacrifice of Isaac, D - Guards at the Crucifixion, E - Massacre of the Innocents, 1100-1150 AD, Sicilian or south Italian, Cathedral Museum, Salerno (Car). 605. Mosaic, The Betrayal and Crucifixion, 1180-1190 AD, Siculo-Byzantine, in situ, Monreale Cathedral, Palermo. 606. Capitals, late 12th century AD, Siculo-Norman, in situ, Cloisters, Monreale Cathedral (Bell., Cri). 608A to 608C. Ivory box, A - 'Philistines', B - 'Goliath', C - 'Goliath', The Rome Casket, late 12th century AD, Sicilian or south Italian, Palazzo di Venezia Museum, Rome. 609A to 609I, Manuscript, A - 'Infantry weapons,' B - 'Byzantines besiege Mopsuastia,' C - 'Byzantines besiege Proslav,' D - 'Arabs attack Edessa,' E - 'Arabs defeat Procopius,' F - 'Arabs sack Salonika,' G - 'Emir defeated by Bardes,' H - 'Arabs,' I - 'Saracens,' Skylitzes, 12th-13th centuries AD, Siculo-Byzantine, Bib. Nac., Cod. 5-3. N. 2, ff. 151v, 166r, 208, 99v, 111v, 136v, 116v, 39v, 41r and 54v, Madrid (Grab, Sev). 610A to 610K. Manuscript, A - "Imperial troops besiege Naples," B - "Villagers fight Diopuldo," C - "Defenders of Salerno," D - "Muslim troops in the Triumph of Tancred," E - "Traveller," F - "The Royal Standard," G - "Weapons aboard a ship with a Muslim crew," H - "Murder of a Muslim child," I - "Sicilian Archers," J - "Siege of Salerno," K - "Siege of Naples," Chronicle of Peter of Eboli, early 13th century AD, Sicilian or south Italian, Bürgerbib., Cod. 120, ff. 15, 130, 111, 102, 101, 102, 119, 127, 131, 117 and 109, Bern (War). 611. Manuscript, Latin translation of al Sūfī's Book of Fixed Stars, 1220-1250 AD, Sicilian or south Italian, Bib. Arsenal, Ms. 1036, Paris (War). 614. Helmet from Chernigov, c. 960 AD, Russian, State Hist. Museum, Moscow (Kir M). 615. Helmet from Chernigov, c. 960 AD, Russian, State Hist. Museum, Moscow (Kir M). 616. Helmet from Gnezdovo, 10th century AD, Kievan Russian, State Hist. Museum, Moscow (Kir M). 617. Helmet from Mokroe, c. 1000 AD, south Russian, Hist. Museum, Lvov (Kir M). 618. Helmet from Gnezdovo, 10th century AD, Kievan Russian, State Hist. Museum, Moscow (Kir M). 622. Fresco, 1120-1125 AD, Kievan Russian, in situ north-west tower, Church of Santa Sophia, Kiev. 623. Relief, Sts. Nestor and Dimitri, 11th century AD, Kievan Russian, in situ Mikhaylovskaya Dimitriskaya Monastery, Kiev (Grab S). 624. Helmet from Nemiya, 11th century AD, Pecheneg, Debretzin Museum, Venhriya (Kir M). 625. Manuscript, Radzilovskaya, c. 1175 AD, Russian (ex-Kir V). 629. Armour and weapons from the Kovali region, 12th-13th centuries AD, Kievan Russian, present location unknown (ex-Kir M). 630. Lamellar cuirass fragment from Kitaev, 12th-13th centuries AD, Kievan Russian, present location unknown (ex-Kir M). 631. Vambrace from Bogatogo Zhilisha, Urals region, 1200-1240 AD, Russian (? ), present location unknown (ex-Kir M). 632. Chanfron, 1200-1240 AD, Kievan Russian, present location unknown (ex-Kir M). 633. Helmet from Kiev, early 13th century AD, Kievan Russian, Hist. Museum, Kiev (Kir M). 634. Manuscript, Psalter, 13th century AD, Serbian, Stadtbib., Munich. 635. Relief from Chelyabinsk, St. George, c. 1250 AD, Russo-Siberian (? ), Goz. Russkiya Museum, Moscow (Kir M). 636A to 636C. Manuscript, A - 'Goliath,' B - 'Guards of Nebuchadnezzar,' C - 'David and his soldiers fight over bread,' Simonovsko-Khludovskaya Psalter, c. 1270 AD, Russian, location unclear (ex-Kir V). 637A to 637C. Manuscript, A - "Barbarians besiege Rome," B - "Soldiers with St. Theodore," C - "Goliath," Armartola History, c. 1300 AD, Russian, location unclear (ex-Kir V). 638. Manuscript, Jamiʿ al Tawārīkh, 1300-1310 AD, Iranian, Preussischer Kulturbesitz, Ms. Diez A.70, ff. 7 and 19, Berlin (Ips). 639A to 639D. Manuscript, A - 'ʿAlī,' B - 'Al Muqannā' besieged by Khalīf al Maḥdī.,' C - 'Nebuchadnezzar destroys Jerusalem,' D - 'ʿAlī,' Chronicle of Ancient Peoples, 1307-8 AD, west Iranian, Edinburgh Univ. Lib., Ms. 161, ff. 92r, 93v, 134v, 16r and 162r (Gray R). 640. Manuscript, 'Rustan captures the Khāqān, ' Shāhnāma, early 14th century AD, west Iranian, Museum of Fine Arts no. 20.1841, Boston. 641. Manuscript, Kitāb-i Samak ʿAyyār, early 14th century AD, west Iranian, Bodleian lib., Ms. Ous. 381, ff. 3r, 31v, 39v, 121r, 180v, 221v, 268v, 276v, 283v, 61r, 68v, 109r, 159v, 251, 302r, 307v, 311r and 368r, Oxford (Elg). 642A to 642D. Manuscript, A - 'Siege of Ūq', B - 'Execution', C - 'Mongols and Persians', D - 'Arabs', History of the World, 1314 AD, west Iranian, ex-Royal Asiatic Soc., ff. 124v, 52r, 25r, 30v, 3r, 7r and 27r, London (Elg). 643. Manuscript, Jamīʿ al Tawarikh. 1314 AD, Iranian, Topkapu Lib., Ms. Hazine 1653, f. 165r, Istanbul (Ips). 644. Manuscript, Shāhnāmah, early 14th century AD, Iranian, Chester Beatty Lib., Dublin (Bin). 645A and 645B. Manuscript, A - 'Lahak or Farishward,' B - 'Warrior of Mazandaran,' Shāhnāmah, early 14th century AD, formerly Pozzi Coll., Paris (ex-Blo M). 646. Manuscript, Nashmi the Archer, 1621-22 AD, Iranian, Fogg Art Museum no. 1960.197, Boston. 647. Metal pen-case by Ahmad al Dhakī (? ), 1304 AD, Mamluk Syrian, Louvre, Paris. 648. Metal ewer inscribed to Nasir al Dunya wa’l Din Muhammad ibn Qala’un, early 14th century AD, Mamluk, Metropolitan Museum no. 91.1.571, New York. 649. Pottery fragments, early 14th century AD, Mamluk Syrian, National Museum, Damascus. 650A and 650B. Manuscript, A - "Khalīf with Arab Soldiers," B - "Dhū' l Qarnayn and guards," Kitāb al Hayawan, early 14th century AD, Mamlūk Egyptian, Bib. Ambrosiana, Ms. D. 140 Inf. SP. Nunc. 67, ff. 20v, 36r and 259, Milan. 651. Manuscript, Astrology of Abū Maʿshar al Balkhī, early 14th century AD , Egyptian (? ), Bib. Nat., Ms. Ar. 2583, Paris. (Hal). 652. Inlaid bronze cauldron, early or mid-14th century AD, Mamluk (? ), Mevlana Museum, Konya (Ric SI). 653. Pottery flasks, 14th century AD, Mamluk Syrian, National Museum, Damascus. 654. Manuscript, Massacre of the Innocents 1318 AD, Armenian, Matenadaran Lib., Ms. 206, Yerevan (Dou). 655A and 655B. Manuscript, A - 'Persecution of Christians,' B - 'Monks taken before the King,' Barlaam and Joasaph, 14th century AD, Byzantine, Bib. Nat., Ms Grec. 1128, ff. 4v and 116v, Paris (Ners B). 656. Frescoes, 14th century AD, Byzantine, in situ, Church of Agios Nikolaos Orfanos, Thessaloniki (Xyn). 657. Manuscript, 'Arrest of Jesus and Crucifixion,' Debre Maryam Gospels, 14th century AD, Ethiopian Kohain, Eritrea (Bux). 659. Manuscript, 'Siege of Jerusalem,' Great Conquests beyond the Seas, early 14th century AD, Spanish, Bib, Nac., Ms. 195, Madrid (Fos). 661. Frescos 1325-1350 AD, Andalusian, in situ, Torre de las Damas, Alhambra, Granada (Gom). 662. Painted ceiling, c. 1330 AD, Italo-Andalusian, in situ, La Sala de los Reyes, Alhambra, Granada (Elg). 676. Ceramic fragment, 10th-11th centuries AD, North African, Benaki Museum, Inv. 11761, Athens (Phil). 677. Ceramic fragment, late 9th-10th centuries AD, Egypt or Iraq, Benaki Museum, Inv. 227, Athens (Phil). 678. Ceramic fragment, 12th century AD, Egyptian(? ), Benaki Museum, Inv. 423, Athens (Phil). 679. Ceramic fragment, 12th century AD, Egyptian, Benaki Museum, Inv. 391, Athens (Phil). 680. Manuscript, Book of Maccabees, from St. Gallen, early 10th century AD, Carolingian, Univ. Library, Ms. Periz F. 17, f.9a, Leiden (Verb).